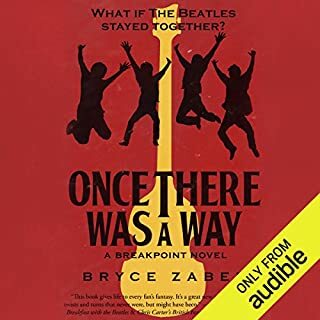 Once There Was a Way: What if The Beatles Stayed Together? is a story of another reality, the one we wish had happened, where the Fab Four chose to work it out rather than let it be. This book is no mere fairy tale but a chronicle crafted from the people and events of our own history, shaped to create a brand-new narrative in which John, Paul, George, and Ringo find a way to stay friends and keep the band together. Imagine there was more. Lots more. It's easy if you try. If You Love The Beatles, You’ll Love This Book! A wonderful fictional journey from the time of The White Album to 2013. Expertly woven with what actually did happen with what could have happened had they stayed together. The author completely captures the personalities of the Fab Four. The narrator's interpretation is masterful, expecially when he does Yoko. I've listened to this book twice in 3 months, and have given it as a gift. The only negative is a cheap shot at the current president and his departed press secretary. Has no place in this great story. I don't understand why this interjection was necessary, except to make the author popular amoung his literary friends. Not why I buy books.